Iranians have been waiting for weeks to hear from former President Ayatullah Akbar Hashemi Rafsanjani. At the height of the demonstrations on Tehran's streets, when hundreds of thousands of people called for a do-over of the June 12 presidential election officially won by incumbent Mahmoud Ahmadinejad, many Iranians have wondered if Rafsanjani, one of the Islamic Republic's most powerful men and a leading supporter of defeated presidential candidate Mir-Hossein Mousavi, would mount a challenge to Ahmadinejad's main patron, the Supreme Leader Ayatullah Khamenei. So when word spread that Rafsanjani would deliver the keynote address at Friday prayers July 17 at Tehran University, one of the country's highest-profile platforms, many opposition supporters hoped his speech would provide new impetus to the protest movement. Mousavi himself, rarely seen in public these days, attended the prayer service. Taking no chances, security forces deployed in force hours before the event, and authorities filled the prayer hall with government supporters. In the end, though, the speech was more conciliatory than confrontational. 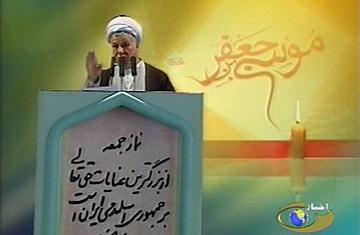 Rafsanjani made several nods to opposition sentiment, acknowledging that the events of recent weeks constituted a "crisis" for the Islamic Republic. He also used strong terms to deplore the violence that broke out. But he praised the government's preparations for the election and said it occurred in an atmosphere of "healthy competition" and "unprecedented freedom." Crucially, he appeared to call for the opposition to back down in exchange for concessions from the government  the release of opposition prisoners and a relaxation of controls over the media. "My sisters and brothers, we have to find a way of maintaining unity," he said. "For the protection of the state and our values, we have to seek to maintain our unity for future generations." This would be possible if the will of the people is respected, he said, but he made no mention of allegations of electoral fraud. Indeed, his call for unity in the face of outside threats even played into the government's narrative that the postelection unrest was not an expression of popular will but the result of foreign agitation. Though perhaps not the clarion call that the rank and file may have been hoping for, the notes of compromise struck by Rafsanjani made sense within the context of a power struggle at the apex of the Islamic Republic, according to Trita Parsi, president of the National Iranian American Council. "The phase we're in now is one where the different sides are trying to determine the rules by which they'll continue their political conflict," he says. "Remember, these guys are all in the same boat to some extent, all invested in the regime's survival. And if they keep this fight going without any rules, they run the risk that the system could collapse and take them down with it. Both sides have an incentive to avoid that." Rafsanjani's speech may even have been a smart move as far as his own career is concerned. "Rafsanjani very cleverly positioned himself as a unifying figure, emphasizing the need to bring everyone together," says Parsi. "That was an indirect attack on the Supreme Leader [Ayatullah Ali Khamenei], who has been widely accused of abusing his position by being so partisan in backing the Ahmadinejad faction. When the Supreme Leader is incapable of bringing about unity within the system, then anyone else who is capable of achieving that will strengthen his position relative to the Supreme Leader." But that may not be enough to satisfy those who keep risking their lives to confront the regime in street protests. Surprisingly large crowds of opposition supporters gathered outside Tehran University despite the heavy security presence Friday. Plainclothes officers harassed opposition presidential candidate Mehdi Karroubi, who nevertheless managed to make it into the prayer hall, according to an account posted on an opposition news website by Karroubi's son. Eyewitnesses say that government supporters shouting "Death to America" were met by opposition protesters chanting "Death to Russia" and "Death to China"  two countries that have recognized Ahmadinejad's re-election. Before the speech, protesters called out to Rafsanjani using his midde name: "Hashemi, Hashemi, take back my vote. Hashemi, Hashemi, silence will make you a traitor," and "Honorable clerics, support, support." But with powerful establishment clerics like Rafsanjani shying away from open confrontation with the Ahmadinejad government, the protest movement may need to look beyond clerical leadership. Rafsanjani himself didn't have any suggestions for how the opposition should continue its struggle, other than that it should obey the law. Mousavi advisers have talked about starting a new political party, but that would require government permission. Rank-and-file supports have been reduced to largely symbolic gestures like turning on hair dryers and irons during presidential speeches in order to trigger mass blackouts, or boycotting Siemens Nokia, which they accuse of having sold telecommunications-monitoring equipment to the government. Ahmadinejad, meantime, appears to be growing more emboldened. On Thursday he pushed back against suggestions by U.S. Secretary of State Hilary Clinton that time is running out for Iran to sit down and negotiate with the U.S. over its nuclear-development program. He demanded that the U.S. apologize for interfering in Iran's elections before talks could begin. "They talked nonsense," he said. "They were rude." See pictures of Iran's presidential election and its turbulent aftermath.